Last Week: St. Clairsville lost to Carrollton 27-21 in Carrollton; Meigs defeated Gallia Academy 14-8 in Rocksprings. SCHS offense last week: 91 rushing yards, 124 passing yards. MHS offense last week: 77 rushing yards, 187 passing yards. SCHS offensive leaders last week: QB Dustin Carrothers 8-29-5, 124 yards; RB Brady Kolb 6 carries, 34 yards, 1TD; WR Justin Heatherington 4 receptions, 80 yards. MHS offensive leaders last week: QB Cory Cox 11-16-1, 164 yards, 2TDs; RB Cole Adams 11 carries, 74 yards; WR Weston Baer 5 receptions, 68 yards, 2TDs. SCHS defense last week: 297 rushing yards, 6 passing yards. MHS defense last week: 222 rushing yards, 89 passing yards. 1. The Marauders have an extra day to prepare for SCHS, as this game will be on Saturday night. The last time MHS played on Saturday was September 28, 2013, when the Marauders claimed a 43-18 win at Warren. 2. Last Week, the Red Devils’ special teams unit was outstanding, returning both a kickoff and a punt for touchdowns. However, SCHS lost the turnover battle by a sizable 6-to-1 count. 3. Since 2000, Meigs has only started 2-0 four times, 2006, 2007, 2008 and 2015. In school history, the Marauders have started 2-0 a total of 12 times. 4. St. Clairsville is the first team from Belmont County that Meigs has ever faced on the gridiron. 5. Last fall, St. Clairsville finished with a 4-6 record. It was the first time since 2002 that SCHS finished with a losing record and the first time since 2001 that the Red Devils started the year 0-2. Last Week: Frontier lost to Shenandoah 51-6, in New Matamoras; Southern defeated Notre Dame 41-6, in Portsmouth. Last meeting between the teams: September 2, 2016. Southern won 27-6 in New Matamoras. FHS offense last week: 74 rushing yards, 4 passing yards. SHS offense last week: 316 rushing yards, 0 passing yards. FHS offensive leaders last week: QB Eric Todd 1-4, 4 yards; RB Logan Brookover 12 carries, 25 yards, 1TD. SHS offensive leaders last week: RB Riley Roush 10 carries, 195 yards, 4TDs. FHS defense last week: 298 rushing yards, 165 passing yards. SHS defense last week: 127 rushing yards, 0 passing yards. 1. The Tornadoes were grounded last week, attempting just one pass attempt, which fell incomplete. The SHS rushing game more than made up for things, however, as the Purple and Gold led 41-0 less than 20 minutes into play. 2. This is the Southern’s first game on Roger Lee Adams Memorial Football Field this season. Last fall, the Purple and Gold were 4-1 at home, while they were 2-3 at home in 2015. 3. Southern is 7-8 in its last 15 regular season non-conference games, with three consecutive victories. Frontier handed the Tornadoes their last setback in such games, defeating the Purple and Gold by a 30-20 count in the Cougars’ last trip to Racine. 4. Frontier has suffered through back-to-back losing seasons and needed two overtimes for the team’s lone win of 2016. 5. The Cougars barely missed being shutout last week, scoring their lone touchdown with 20 seconds left in regulation. Dating back to last season, FHS has dropped three straight games. Last Week: Eastern lost to River Valley 27-0, in Tuppers Plains; Miller lost to Waterford 35-25, in Waterford. Last meeting between the teams: September 2, 2016. Miller won 21-14 in Tuppers Plains. Current head-to-head streak: Miller has won 2 straight. EHS offense last week: 204 rushing yards, 14 passing yards. MHS offense last week: 160 rushing yards, 53 passing yards. EHS offensive leaders last week: QB Nate Durst 4-10-1, 14 yards; RB Josh Brewer 20 carries, 94 yards; WR Blake Newland 1 reception, 8 yards. MHS offensive leaders last week: QB Colby Bartley 3-12, 51 yards, TD; RB Zach Waldrop 24 carries, 108 yards, 2TDs; WR Levi Vanbibber 3 receptions, 28 yards, 2TDs. EHS defense last week: 191 rushing yards, 101 passing yards. MHS defense last week: 199 rushing yards, 80 passing yards. 1. In the past 21 years, EHS is 12-9 against the Falcons. Only six of the 21 contests have been decided by one score or less. 2. Eastern’s last trip to Hemlock resulted in a 28-0 MHS victory, on September 4, 2015. The Eagles’ last victory in Perry Count was a 28-12 triumph, on September 6, 2013. 3. Miller has improved its record in each of the past three seasons, with its 2016 record of 7-3 being the best mark for a Falcon team since 2000. 4. This is the first of Eastern’s five road games this season. Last fall, EHS was 2-3 away from home. The Eagles last posted a winning record on the road in 2014, when they were 3-2 away from East Shade River Stadium. 5. This is the first Tri-Valley Conference Hocking Division game for the 2017 Eagles. EHS was sixth in the league last fall with a 3-5 record. In a preseason media poll, Eastern was predicted to finish fifth in the TVC Hocking this fall, while Miller was picked fourth. 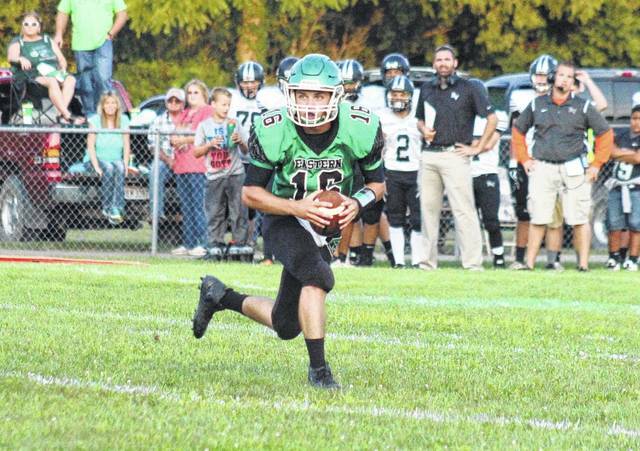 Eastern junior Nate Durst (16) rolls out of the pocket during the Eagles’ Week 1 loss to visiting River Valley.